Last week I ordered a package. I was so excited for its arrival! Even K was excited. On the day it was supposed to come we waited with anticipation. And waited. And waited. Finally it came…as I was cooking dinner and the children were in the middle of evening craziness. (I seem to always live on the dinner-hour-shift part of the UPS route.) At any rate, it finally came. We were so excited! The kids couldn’t wait for me to open it, which made for a tricky process…run to the kitchen, stir, run to the other room, cut the tape. Run back to the kitchen, add spices, stir, don’t put the scissors in the pot, run to the other room open the box, etc. We finally got it open. 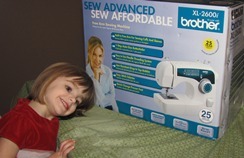 My first sewing machine. It strikes terror in me. I grew up around sewing machines. My mom is an excellent seamstress and I spent many many hours standing around in pinned fabric that she was making into clothing for me. I know enough about sewing and sewing machines to be dangerous. Seriously dangerous. I know what the machine can and should do, but I cannot make it actually do it. And now I have one of my own. And I have no mom or mother-in-law nearby to help me when I get the machine messed up. Hmm…what was I thinking? The kids can’t wait for me to get this machine open and running. I pore through the manual to figure out to thread the darn thing. Which takes time (and more concentration that is allowed in the three-second period before the next interruption), so I have to wait. After dinner Dad tries to occupy the natives in another room while I finally get to look at my new nemesis…I mean sewing machine. I carefully finish unpacking it. I carefully read the manual and after much diligence, I threaded the machine! I did it! It only took 30 minutes. Thirty minutes. To thread a sewing machine. Now, for the record, it’s not as if it was a peaceful 30 minutes. Children running in and out. K continually asking if she can help me sew. S wanting to provide advice, since he knows people who sew. J frequently pulling on Momma and preferring not to share attention with a machine. All while I’m trying to focus and read this manual like a tactical war manual…I will conquer this thing! 30 minutes to thread a machine isn’t a great productivity rate, but I’m so happy it’s successfully done, I overlook that detail. I start to sew my first stitches and I’m so proud! It looks…um, it looks like a nice straight line of holes. I guess I wasn’t finished threading. A little bit more work and VICTORY! I did it! I stitched some material! I haven’t made a darn thing, and who knows how many times I’ll get this thing tangled up, but at this point I’m celebrating stitches in fabric. The next day…even more success! Here’s a pic! Yes, this is some tattered material sewn poorly into squares. The important thing is that is what I meant to do. I know…I’m all that. Crafting blogs, look out. Chel is on the loose with a sewing machine. Okay, many of you have been sewing for decades, so these minor successes seem trivial. However, for me it’s still a triumph. Soon I’ll be posting all sorts of crafty projects…ha ha ha ha ha ha ha ha ha. Probably not. Instead I’ll be the one posting how I sewed the garment I was mending to the table-cloth or the pants I was wearing…sigh. I’ll be sure to keep you posted. As long as my fingers aren’t stitched together. I can understand that…I don’t think I’ll be a sewing lover either! I think it’s going to cause much more stress than pleasure, but it’ll be good to have and a heck of a lot better than doing it by hand. Yes, I’m counting on some lessons when you come! 🙂 Thanks! Yay!! I was wondering last night if it came and if you had thrown it out the window yet… tee hee! Try not to be intimidated. You can do this. and in the end, its just fabric and thread. It will get easier. Just start with easy stuff, small successes are the way to build your confidence.